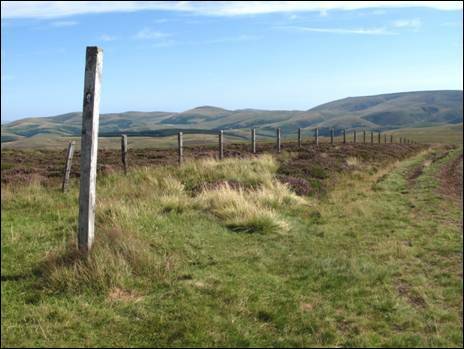 The border between England and Scotland slices through the Cheviot Hills like a knife through butter. Walkers wishing to gain access to these hills can do so via a number of quiet valleys on both sides of the international divide including, on the English side, snake-like Upper Coquetdale. To the north of the border lie a myriad of small rounded hills which are relatively little visited and which present the determined walker with a host of potentially interesting if slightly demanding routes when tackled from English soil. This is one such walk. From the banks of the River Coquet at Buckham`s Bridge this walk follows the deep-set Blind Burn as it makes its way to an airy border crossing north of Lamb Hill. The walk then crosses the grandstand viewpoint of Callaw Cairn before descending gently towards the Heatherhope Valley. Along the way, a short detour takes you to the summit of Church Hope Hill and another outstanding view. As you eventually make your way back to Upper Coquetdale, via Hard Rig, you will cross the heather-covered tops of Mozie Law and Beefstand Hill before following a less-than-ordinary route to the grass-carpeted summits of Carlcroft Hill and Broadside Law. In all probability you will be utterly alone. 1. The 9 mile journey from the tiny village of Alwinton, the last in Coquetdale, to the start of this walk at Buckham`s Bridge must be one of the leading contenders for the finest road journey in Northumberland. As the narrow single track road twists and turns on an undulating course past emerald-green hills it crosses the River Coquet on six separate occasions at Linbriggs, Shillmoor, Bygate Hall, Barrowburn, Carshope and Carlcroft. There is a small parking area on the right hand side of the road immediately before the 1955-built concrete Buckham`s Bridge (GR NT824107). At last you are breathing in the fresh Cheviot air, happy to be ready to start your walk across the border into Scotland. So, with an ample supply of sandwiches in your sac, lock up your car and head back down the road you have just travelled along with the River Coquet chattering away to your right. Barely into your stride you will pass the farmstead of Blindburn, first some outbuildings on your left and then, slightly above you, the detached early-19th century farmhouse. In his 1903 book, `Upper Coquetdale Northumberland Its History, Traditions, Folk-lore and Scenery`, David Dippie Dixon described this house as, “picturesquely situated on the north bank of the Coquet, close to where the streamlet that gives it its name enters the main stream. Steep and lofty hills close it in on all sides”. Next along the road are two 1950`s-built, stone-faced terraced houses followed by the bridge over the Blind Burn which, like Buckham`s Bridge, was also built in 1955. Do not head past the terraced houses. On your left, immediately before these terraced houses, you will spot a signpost indicating, `Yearning Hall 1½ Border Ridge 2½` and a small wooden gate engulfed, in summer, by a mass of nettles. This is your route onto the hills. So, protecting any exposed parts of your body, make your way through the gate and beneath the trees to emerge onto the green bank side of the narrow Blind Burn. Turning to your left, make your way to the small wooden footbridge over the burn and, once on the other side, head straight up the facing slope as far as the post and wire fence. Now turn left and follow the fence as far as a stile (GR NT825111). Cross over. 2. You are now following, on your left, the course of the Blind Burn along a thin public footpath which is occasionally waymarked. At times the path will fade but by keeping in touch with the burn you will not go astray. Along the way as you squeeze between the lower slopes of Yearning Law, on your left, and Broadside Law and Carlcroft Hill, on your right, you will pass a circular stone sheep stell. Eventually, after just over 1 mile of sometimes boot-squelching walking since crossing the stile, you will reach the point where the burn bends slightly to your right and a subsidiary burn arrives from the left where you will see the tops of a number of conifers. This is the way ahead. So, turn to your left, cross over the burn and head uphill along a skinny path towards the trees. At the top of the rise you will reach a fence corner and the forlorn ruins of Yearning Hall, on the other side of the fence (GR NT817124). Do not go over the stile other than to have a peep at this former two-roomed shepherd`s cottage which was last occupied around 1941 when the land was purchased by the Ministry of Defence. At the fence corner post follow the right hand fence which heads in a generally north westerly direction and, when the fence bends to the left, leave it behind and continue more or less straight on to reach a marker post and a clear, although somewhat damp, track through an expanse of empty grasslands. When the track splits in two take the left fork and, as you head towards the distant Yearning Saddle and the resident refuge hut, be sure to avoid any subsidiary track leading off to your right. Soon you will merge with a public bridleway which has taken a slightly different route from Blindburn and, as you continue onwards, you will enjoy far-reaching views to the south and west. The sense of space is immense. Aided by the odd marker post you will soon arrive at Yearning Saddle and the relative comfort of the refuge hut (GR NT804128). Make an entry in the visitors book if you so wish. 3. 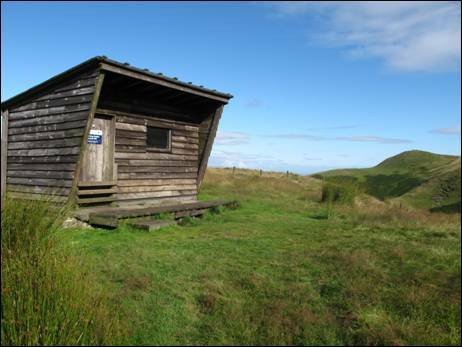 You are now on the route of the Pennine Way and, as you turn to your right and head uphill alongside the border fence, you are following this, the first long distance footpath to be established in the country, in the direction of a very distant Kirk Yetholm. The route is clear with the fence your constant companion and before much further effort has been expended you will reach the 511 metre (1676 feet) high top of Lamb Hill. 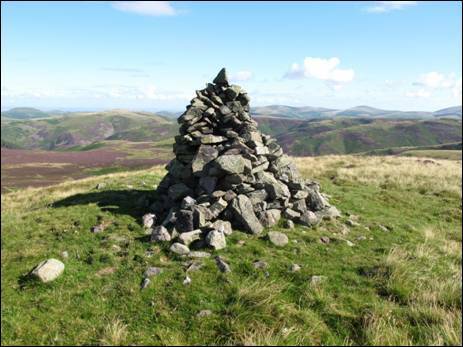 The actual summit, which is marked by a triangulation pillar, stands on the opposite side of the border fence so a short clamber into Scotland is now required. That over and done with, continue along the stone-flagged Pennine Way for approximately 800 metres where you will find a small gate through the fence you have been following, just as you begin the climb towards Beefstand Hill. Once through the gate and again on Scottish soil, you will need to turn half right and follow, as best you can, a very faint path through the shin-high heather. 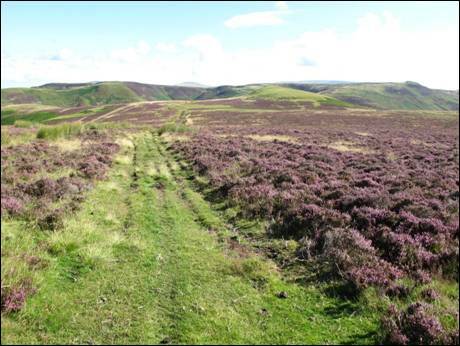 This path is shown on the 2009 revision of the Ordnance Survey OL 16 1:25000 scale map of the Cheviot Hills. After a wee while the path becomes a little clearer with fine views back over to the steep north facing slopes of Lamb Hill. 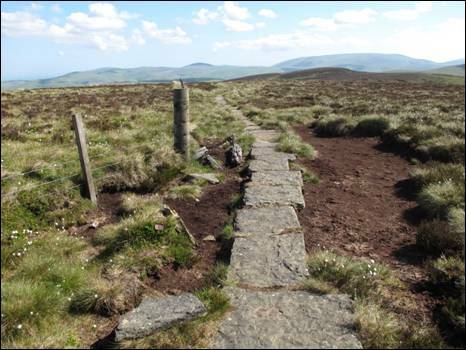 When the path splits in two, with the right hand spur heading towards a gate through a fence, stick with the left fork as far as the saddle immediately below the prominent height of Callaw Cairn. 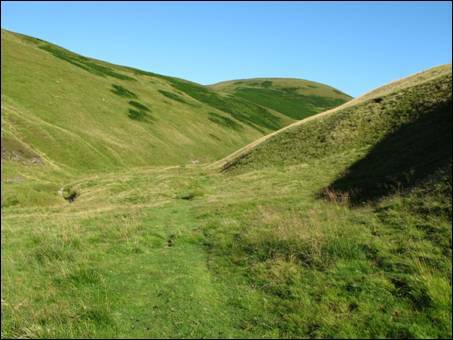 Now make your way uphill on a slim green path to reach the impressively-built hill-topping cairn (GR NT809145). The relatively modern cairn which you are now standing beside is built on top of a much older cairn measuring some 11.5 metres in diameter and, whilst some of the original stone core is still visible, much is now grass-covered. The exact purpose of this more ancient cairn is not known. The views are outstanding in every direction so be sure to wander around the ample top to sample every panorama on offer. Then, with your back to the cairn, head in a northerly direction and descend the heather-carpeted hillside to a post and wire fence. Cross over and, on joining the parallel track, turn left. You are now on your way over Callaw Moor on a course which will ultimately lead you to the Heatherhope Valley. 4. The track, which bends gently to your right, is easy to follow although in parts it can be a little bit muddy as it cuts a course through the heather and grass-covered moor. Ahead, in the middle distance, the parapet of hills on the far side of the Heatherhope Valley makes a fine picture with the beefy Greenbrough Hill centre stage. In the far distance the conical and distinctive summit of The Schil can just be seen. To your half right, a little way across the moor, lies your next objective the green-sloped Church Hope Hill and, as the track draws level with this minor top, turn right and make a short detour to the 390 metre (1280 feet) high summit (GR NT811157). This is marked by an upright stone surrounded by a number of small boulders. The view is outstanding with both Greenbrough and Blackbrough Hills dominant. Now return to the main track and continue your downhill journey. Once you begin to close in on the valley floor, just below the heather line, be sure to turn to your left and to head through the metal gate. Stay with the green path and soon you will reach the rough gravel track through the valley. To your left lies the now redundant and clearly visible Heatherhope Reservoir and beyond that the farms of Heatherhope and Greenhill. 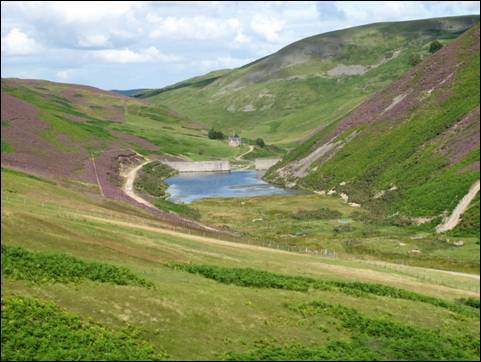 Referring to this track in his 1950 booklet, `A Guide to the Cheviot Hills`, F. R. Banks described the route as, “passing the tiny reservoir which supplies Kelso, climbs on and out to join the Street short of the Border”. The route described by F. R. Banks climbs, “on and out to join the Street”, via the clear track over Philip Shank whilst your route back to the border fence takes a rather slightly different course. 5. Slightly to your left lies an old railway waggon at the base of the triangular-shaped Sundhope Kipp, a projecting spur of Greenbrough Hill. Standing at a height of 419 metres (1375 feet) above sea level, this spur is crowned with a large Iron Age hillfort. Your route turns to the right and follows the valley track as far as a fine circular sheep stell. Once there, cross over the Heatherhope Burn, via a shallow ford, turn to your right and follow the track with the burn initially on your right. As you wander through this narrow, steep-sided valley you will pass a wooden building and also re-cross the burn on two occasions until finally you reach another old railway waggon. Along the way, do not be seduced by the track heading up Philip Hope. This will only lead you astray. The way ahead now lies to your left and climbs steeply up the perfectly-named Hard Rig. So, take a deep breath or two before heading uphill on a clear track. After a short distance, the track splits in two and, whilst both spurs lead to exactly the same place, the right hand fork should be followed. This keeps close to the fence and, although it is less distinct than the alternative track, it is the preferred option. As you huff and puff upwards, remember to pause a time or two to take in the view back over. Eventually, the track all but disappears a short distance from the top of Mozie Law. At this point, leave the remnants of the track behind by turning to your right and heading straight upwards. In a very short distance, you will reach the border fence and the tall acorn-signed marker post on the unremarkable summit of Mozie Law (GR NT828150). At a height of 552 metres (1811 feet) this is the highest point of your walk so far. There is higher still to come. But first, have a look around, especially to the north east where you will see the huge bulk of The Cheviot in the far distance and the shapely curves of Windy Gyle slightly closer to hand. 6. Now that you are back on English soil, turn to your right and head off along the route of the Pennine Way with the border fence securely on your right. Ahead, you will see the long curved back of Beefstand Hill, your next objective. In his 1960-published book, `The Pennine Way`, writer Kenneth Oldham described this hill as, “a broad and shallow dome of darkened tints of heather moor, a giant beefsteak, limp and placid, draped across the saddle”. Judge for yourself as you make your way along the mainly flagged pathway to the unmarked, 562 metre (1844 feet) high summit crossing along the way a ladder stile over a relatively new fence. The summit of Beefstand Hill, the highest point of the day, lies where the fence you have been following turns right and begins its descent towards Ewemoorside Hill. If you have not already eaten all your sandwiches, this makes a superb picnic spot. Close to the corner of the fence, on your left hand side, you will see a faint quad track cutting through the shin-deep heather. This is the way forward, a route which will take you across the rough, damp and lonely ground of Beef Stand and onto the drier terrain of Carlcroft Hill. Initially, the track is easy to follow but, as you begin to get closer to a fence, which you crossed slightly earlier on your way to Beefstand Hill, this track all but disappears into the boggy ground. At this point it is preferable to keep with the fence and, in time and with a little patience, you will once again pick up the track as it winds its merry way ever so gently downwards. Always be sure to keep within shouting distance of the fence as you will need to pass through this when you eventually reach a large gate. Once through the gate, follow the track onwards and soon you will be able to spot the small, green Carlcroft Hill. When the track begins to climb the easy, grass-carpeted slopes of the hill turn half right and head towards the actual summit which stands alongside a meeting of fences. Go through the gate on your right. This, at 447 metres (1467 feet) high (GR NT829121) is a relatively insignificant top in terms of grandstand views, one perhaps for the record only. 7. Now, with the fence on your left, start your descent towards Broadside Law, your final top of the walk. First you will pass a step stile over the fence and then, further on, a couple of gates through the same fence. Along the way you will, in the unlikely event that you have not already done so, get your boots well and truly wet. No matter, the end is nigh! Go through this second gate and follow the track towards the slope in the near distance. This is Broadside Law, rarely-visited, 444 metres (1457 feet) high and dipping its feet in the River Coquet. As the track starts to climb across the hillside, turn to your right and make a pathless bee-line ascent to the unmarked summit (GR NT829113) where you will find a small enclosure and a few sheets of corrugated metal. The views towards Thirl Moor and the head of Upper Coquetdale are simple delicious. Make sure to have a good potter about and you will discover that there is a superb, eagle`s-nest view down to the buildings of Blindburn. Now set your compass to the west and head towards the prominent dip. Once reached, turn to your left and head downhill, picking up as you go a faint trace. Below you meanders the narrow Blind Burn, a watercourse you became acquainted with a few hours ago. At the bottom of the slope, turn left alongside the fence and then, at the fence junction, cross over the right hand fence and head downhill to the wooden footbridge you crossed on your outward route. Now, it is a simple matter of turning to your left towards the tree-sheltered gate and the single track road through Upper Coquetdale. Once your boots touch the tarmac, turn right and amble back to Buckham`s Bridge and the end of your walk. Barrowburn Farm (self-catering & limited camping), Rose & Thistle Public House, Alwinton (limited), Clennell Hall (including caravan park). Otherwise a variety in Rothbury.